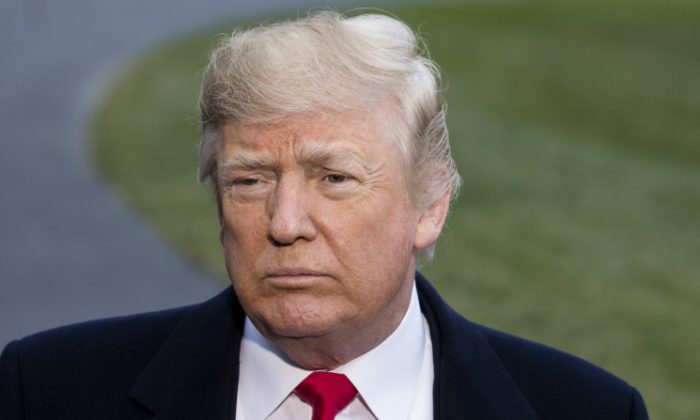 President Donald Trump lambasted the Gun-Free School Zones act in a Monday morning Twitter message, condemning them as a failed measure that invites violence. The gun-free school zones prohibit people from carrying or discharging a firearm on school grounds unless they are authorized. The bill was introduced by then-Senator Joe Biden in 1990 and signed into law by former president George H.W. Bush the same year. Trump’s administration is working on several fronts to prevent another mass shooting in the wake of last month’s massacre at a Florida high school. The president proposed, among other measures, to allow properly trained teachers and staff to carry weapons on school property. Since then, the deadliest school shootings—including the massacres at Sandy Hook Elementary, Stoneman Douglas High School, and Columbine High School—all happened in gun-free school zones. Opponents of gun-free school zones point out that maintaining a full-time police presence at every school is costly. Four out of 10 public schools currently have an armed safety officer, according to John Lott, an economist and gun rights advocate. But Lott says even one officer may not be enough since the uniform screams “shoot me first” to a would-be attacker. “Concealed carry comes with the benefit that attackers won’t know who is armed, and won’t know who they need to attack first,” Lott wrote in an editorial for New York Daily News. The Supreme Court ruled that the Gun-Free School Zones Act was unconstitutional in 1995, but then-Attorney General Janet Reno drafted several measures that circumvented the Supreme Court’s decision. Rep. Ron Paul introduced bills in 2007, 2009, and 2011 that would repeal the act, but none ever made it out of committee. Last month, Rep. Thomas Massie introduced the “Safe Students Act” which would repeal the Gun-Free School Zones Act. On the campaign trail, Trump vowed to end gun-free zones. After the deadly shooting at Stoneman Douglas High School in Parkland, Florida, Trump called for a ban on bump stocks, tougher background checks with a focus on mental illness, arming teachers, and raising the minimum age to buy a rifle to 21. The Justice Department took the first step to ban bump stocks late last week. Trump said on Monday morning that work on tightening background checks and arming trained teachers is moving forward. Several states and municipalities already allow teachers and staff to carry weapons in schools. “Very strong improvement and strengthening of background checks will be fully backed by White House. Legislation moving forward. Bump Stocks will soon be out. Highly trained expert teachers will be allowed to conceal carry, subject to State Law. Armed guards OK, deterrent!” the president wrote.